Massachusetts was the first state in America to ban cockfighting, in 1836, and staging such a contest is a felony, carrying a maximum fine of $1,000 and up to five years in jail. Last week’s seizure of approximately 400 roosters in Northampton in connection with an alleged cockfighting ring was the latest in a series of similar busts that have made headlines in recent years in Massachusetts and nationwide. In June 1988, police raided a cockfighting and gambling pit on Sodom Mountain in the Western Massachusetts town of Granville, seizing 80 roosters, $22,000 in cash, and 48 suspects after “a heated chase through thick woods,” United Press International reported at the time. 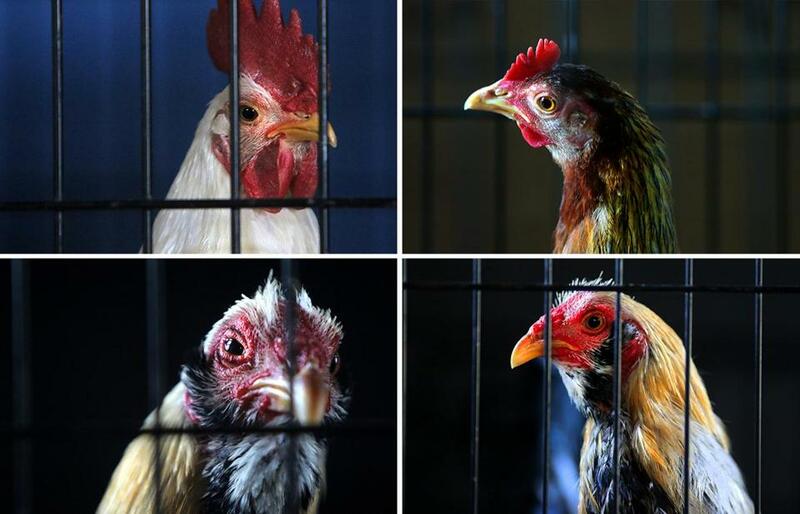 In 2005 in Middleborough, police seized cockfighting paraphernalia and more than 400 chickens and roosters on a 15-acre gated property. Police also discovered books about cockfighting, a dummy rooster apparently used for training birds to fight, an incubator, and vitamins for the birds. More recently, State Police seized three roosters bred for fighting during a motor vehicle stop in Sturbridge in January 2017. The birds had no feathers below their necks and chest areas, and they were covered in gouges on their breasts, legs, and heads. Four Lawrence men were arrested, and authorities said at the time that the suspects had apparently participated in a cockfight in New Jersey. The seizure is believed to be the largest bust of an alleged cockfighting outfit in Massachusetts. “It’s despicable, and hopefully the judicial proceedings will result in punishment appropriately severe for a crime that inflicts such pain and suffering on animals helplessly forced into a horrible way of life,” State Police spokesman David Procopio said when the arrests were announced. Massachusetts was the first state in America to ban cockfighting, in 1836, and staging such a contest is a felony, carrying a maximum fine of $1,000 and up to five years in jail. The practice is banned in all 50 states. But the sport, which has been around for centuries, persists. In illicit contests, birds are pitted against each other, and spectators bet on the outcome. The birds peck and kick each other with spurs attached to their feet, with the loser often fatally wounded. 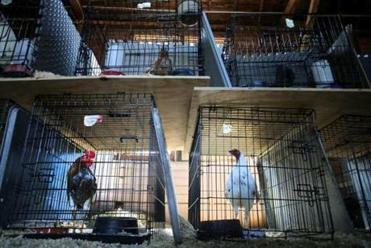 Police made a bust in March 2016 in Tewksbury, where 24 people were nabbed for their alleged roles in a cockfighting ring that yielded 18 chickens with spurs on their feet, five of them severely injured. Police recovered several packages of spurs, kits with tape, and more than $13,000 in cash. The feds have also zeroed in on the brutal practice, with the Justice and Agriculture departments hosting an animal fighting investigations training session in June 2017 at the National Guard Joint Forces Headquarters in Raleigh, N.C. Such fights are a magnet for other serious crimes, including gambling, drug dealing, money laundering, and weapons offenses, according to the DOJ. The largest seizure of fighting birds in US history came last year in Val Verde, Calif., when authorities recovered nearly 7,000 winged combatants in a remote canyon area, according to the Los Angeles County Department of Animal Care and Control. And not every suspect is a career criminal. In one case last year in New York City, Hector M. Cruz, a public school teacher, was arrested for maintaining a farm in the Bronx where he “bred, raised, and trained roosters for cockfighting” and “sold and shipped his roosters to individuals across the country, knowing that the birds were intended for cockfights,” federal prosecutors said in a statement. The birds fetched up to $600 a pop on the black market. Cruz was sentenced in February to three years of probation and fined $1,000. He was also ordered to perform 100 hours of community service and told not to “buy, sell or possess live chickens, roosters, or hens during the period of supervision,” court records show. The owner of the property, Thomas Lee Crow, was charged criminally in connection with the ring, and his case is pending. Emily Sweeney and Jeremiah Manion of the Globe Staff and Globe Correspondents Felicia Gans and Alexandra Koktsidis contributed to this report. Travis Andersen can be reached at travis.andersen@globe.com. Follow him on Twitter @TAGlobe.